Two weeks ago, the RI Dept. 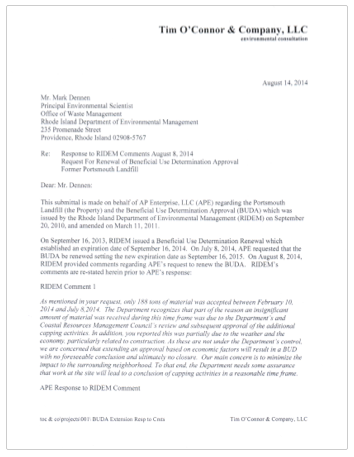 of Environmental Management responded to a request for a time extension by the company conducting capping operations at Portsmouth's former town dump, and yesterday they released two replies, one from the firm's environmental consultant, and the other from the so-called "Landfill Committee." Both letters address DEM's additional conditions for an extension, a commitment to an end date, and immediate action on final cover for areas already capped. The consultant, Tim O'Connor & Company, responding on behalf of Arthur Palmer Enterprise, seeks to justify the extension and offers guarantees on timing. O'Connor reiterates their contention that a "lack of active construction projects" contributed to their ability to source fill material, and expands on their assertion about uncertainty of approvals from the CRMC to address additional areas discovered at the edge of the site. "Those series of events created a lack of predictability" which, they say, "hindered Mr. Peter's [the site manager] ability to negotiate with contractors." "With these events now behind us," the letter continues, "APE and Mr. Peter are willing to commit that the project will complete accepting impacted soils above the residential Direct Exposure Criteria within the next twelve months. It may still be necessary to accept residential soils to finish the cap after that period." Responding to the second request by DEM, for quick action on finishing and seeding the eastern, already capped part of the site, O'Connor says, "APE understands RIDEM's concerns and proposes to continue final capping activities along the residential boundary as a stipulation of RIDEM approving the final BUDA renewal. APE will complete these capping activities within six months of RIDEM's BUDA approval." The response from the "Landfill Committee," signed by Debra Cardoza, is a four-page reiteration of previous complaints about the site, and is copied to the Town Council and state legislators. "We will strongly encourage the Council to use this opportunity to object to a further expansion of this project that was initially presented as a one year effort. It is long past time that this deposit of contaminated soils in Island Park comes to an end." Read the consultant response and the letter from the Landfill Committee.